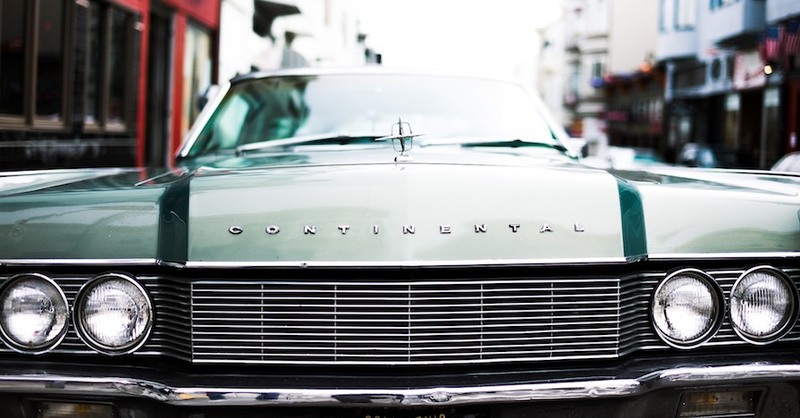 With summer on the horizon, we start thinking about road trips and summer drives with family and friends. You make sure the luggage is packed, the oil is changed, and the tires are aired up, but what about the radiator? Nothing exposes cooling system issues like summer swelter. To help you keep your road trip on track and out of the repair shop, we have put together a few tips and tricks for spotting potential radiator failures before major damage occurs. Radiators rarely have a catastrophic failure without showing signs first, so spending a few minutes under the hood is just a good idea. Remember, always let your engine cool down completely before working with the cooling system. 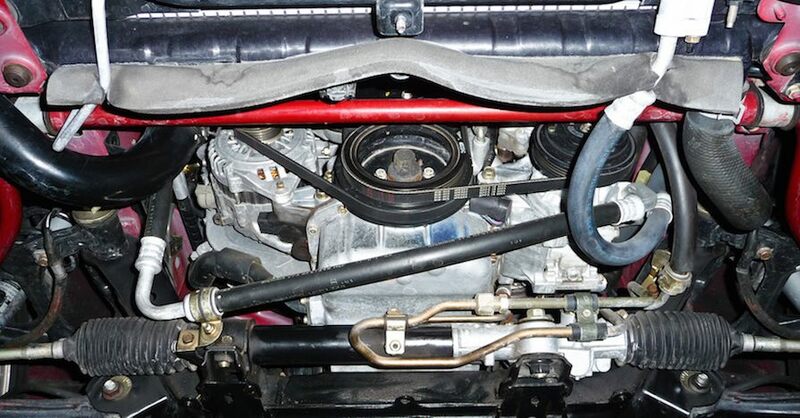 The first thing you should do is pop the radiator cap (or reservoir) and have a look at the coolant inside. There are two colors of coolant- green and orange. Green is the standard basic anti-freeze, while orange is Dex Cool, commonly used in GM engines. The two DO NOT MIX, so don’t. Mixing standard green with Dex Cool will damage your cooling system and possibly your engine. Dirty coolant is a bad thing, but it does tell you that a problem is occurring. 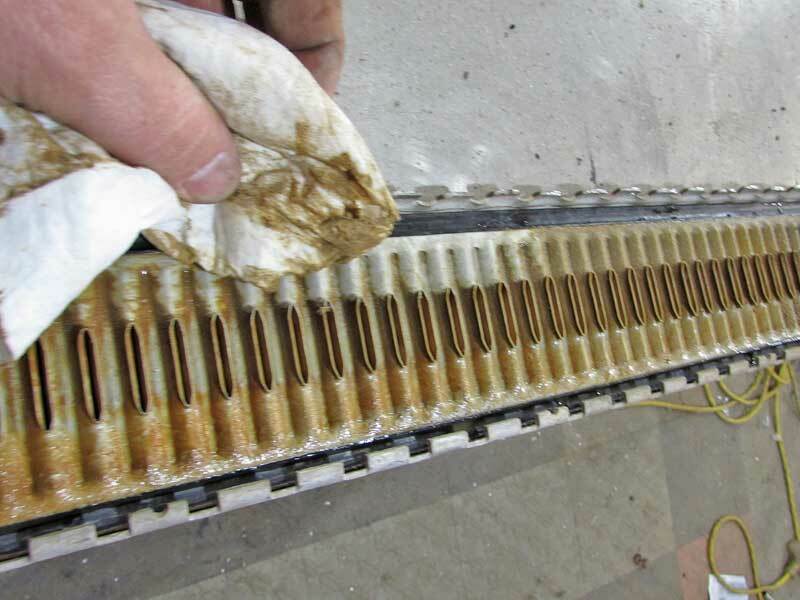 The inside of this radiator shows signs of dirty coolant. There are several signs you want to look for in the coolant. It should be bright green or bright orange, anything other than that means there is a potential issue. 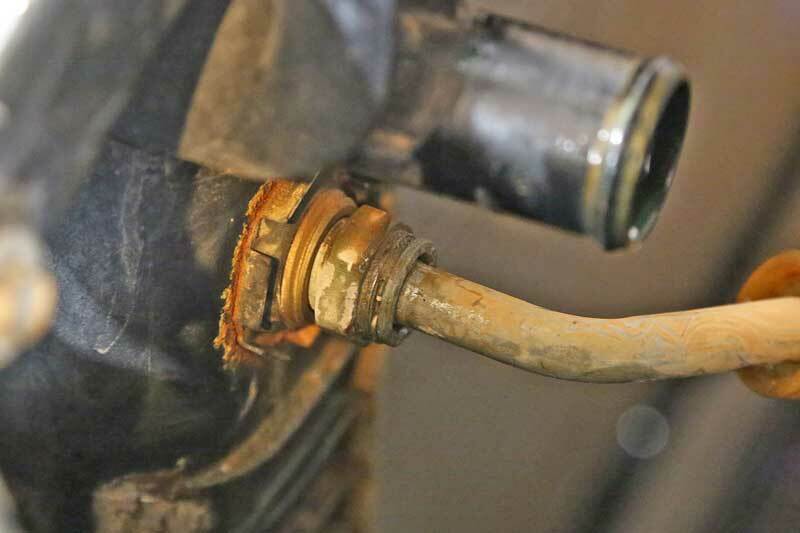 Rust-colored coolant means that coolant was broken down (which happens over time) and is no longer inhibiting rust inside the cooling system. If you see this, you need to change the coolant along with a proper flush and refill with new coolant and water at the correct ratio. When wiped with a towel, you can see the difference. This is actually just dirty coolant, lots of rust and dirty. 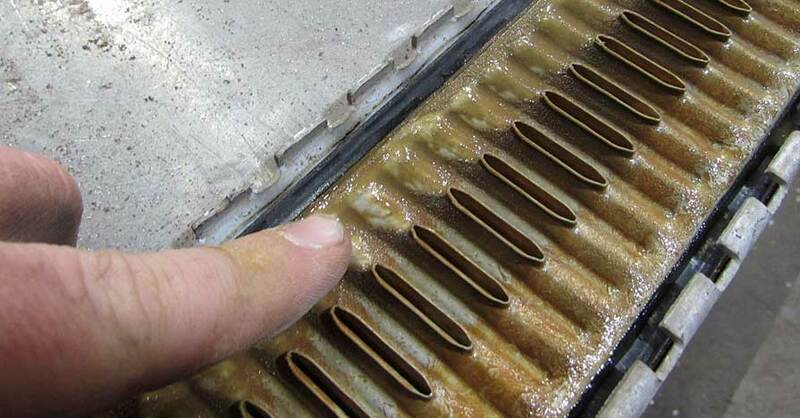 This is one of the reasons you need to flush your cooling system. This stuff is very abrasive. If the coolant is milky, that indicates oil in the system. You could have a major issue on your hands. This is usually an indication of a bad head gasket or leaky intake seal. 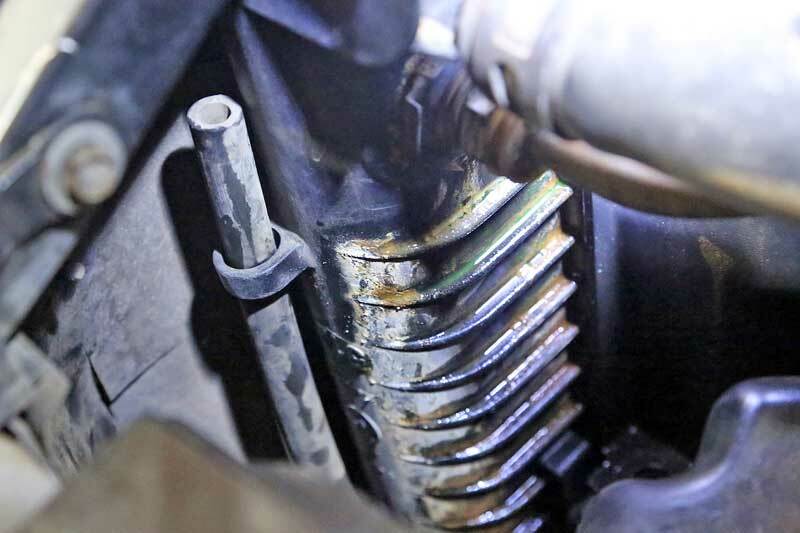 Another potential issue is an oil or transmission cooler leak from inside the radiator itself. Almost every automatic transmission equipped vehicle has a cooler built into the radiator, and many cars and trucks have oil coolers in the radiator as well. If you see oil in your radiator, you should schedule a visit with you local NAPA AutoCare professional for consultation. Aside from color, the level itself is an important thing to check. Not only does your cooling system function better when it is full, but also lets you know that all is well and there are no leaks. 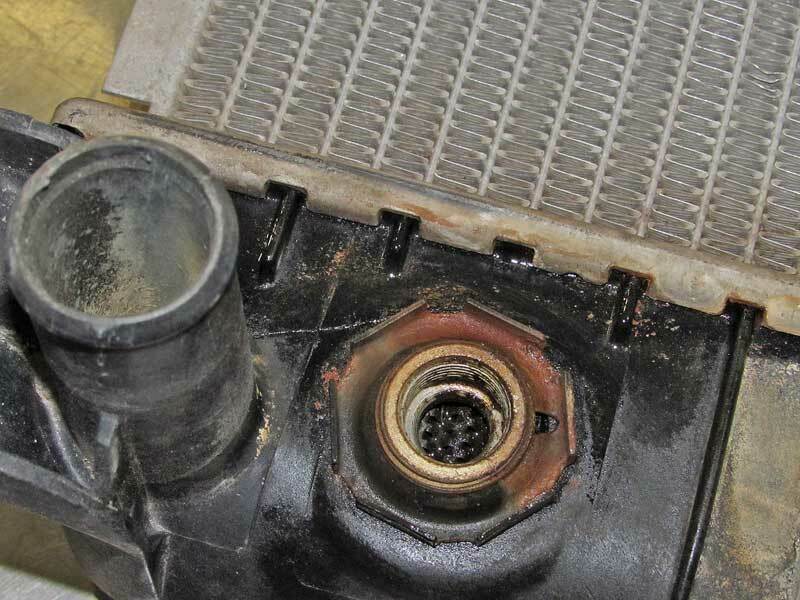 If the coolant is low, that could be a symptom of a leaking radiator. 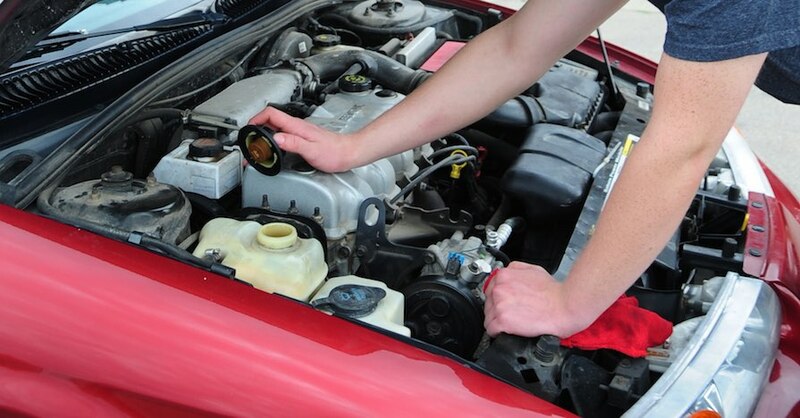 Refill the radiator or reservoir (to the cold full line) with fresh coolant and water (typically mixed 50/50). 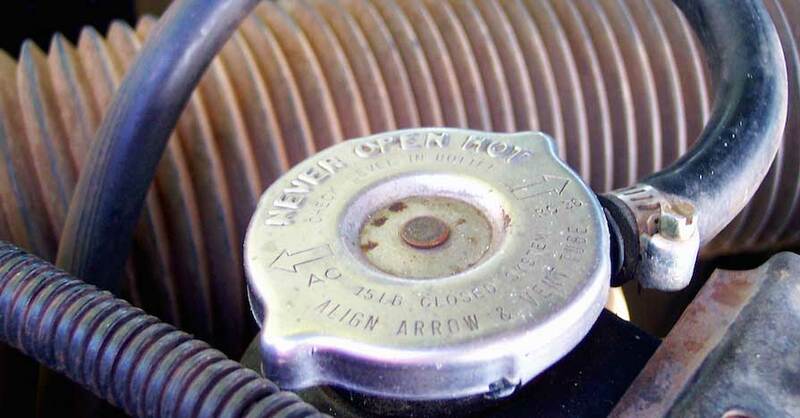 Remember NEVER remove the radiator cap when the engine is hot. With the engine cold and the radiator cap off, start the engine and allow it to come to operating temp. Once the engine hits operating temp, the coolant level will likely go down a bit. Top off the radiator or reservoir and replace the cap. At this point, you know that the system is full. Check the levels when cold over the next few days. If the level drops, you know you have sneaky leak. Radiator leaks can be really hard to find. Unless the leak is large enough to leave puddles on the ground or under the hood, you may never know you have one until it is too late. However, there are some tell-tale signs on the radiator that can let you know that there is a small leak. You can see white scale and coolant on the ribs of the tank. That is sign of a leak. Look over the fins on both sides. You are looking for oily or discolored areas on the fins. 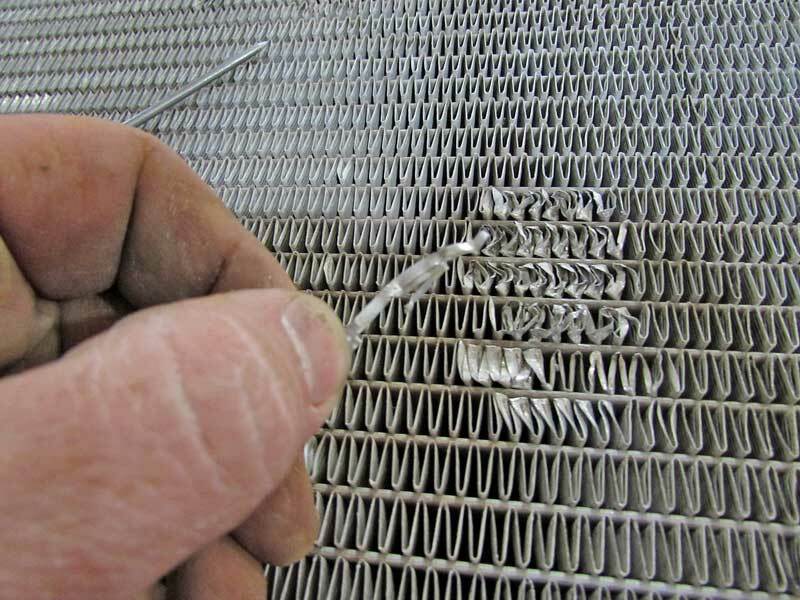 Aluminum radiators are the easiest to do this as they are unpainted, but older copper and brass radiators discolor with leaks as well. On aluminum fins, the leak will look like a grease stain, depending on the size of the leak. Copper and brass radiators take longer to show leaks, but when they do, it is usually a mixture of green\orange oxidation and scale, exactly like a penny that has been in water for a while. Newer vehicles typically have aluminum radiators with plastic tanks. The tanks are secured with a bunch of small tabs folded over the edges of the tanks. 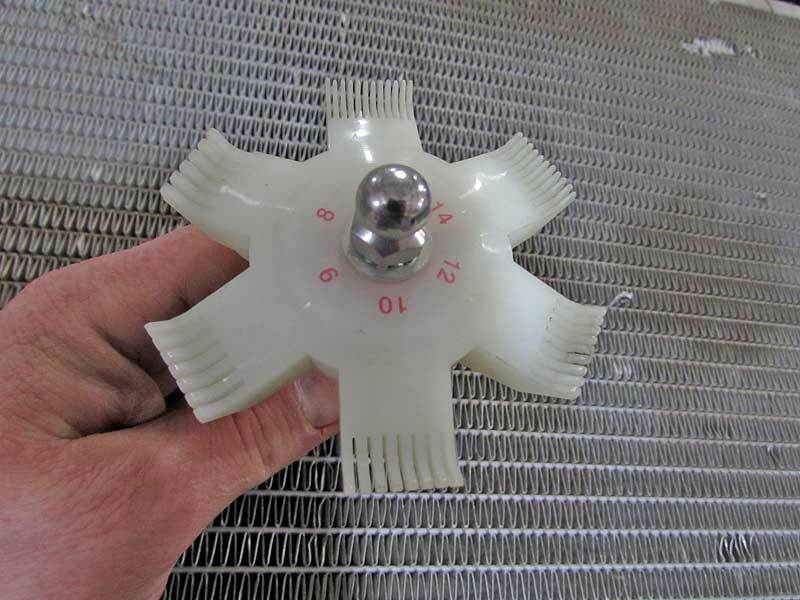 Even though the mounting point for the radiator itself is isolated with rubber bushings, there are several hard lines threaded into the tanks. Over time, the stress of the lines can cause cracks in the plastic tanks. This is a very common problem for all modern cars with plastic tanks. We tracked the scale to the area around the upper oil cooling line on the driver side. Note all the crust. Inspect the tanks for signs of coolant. The cracks are often around the hard lines or other mounting points. If you find a crack, you should replace the radiator immediately. The crack is about two inches long, running through the edge of the fitting. This is a common issue for radiators with plastic tanks. The fastest way to get a damaged radiator is to hit something. 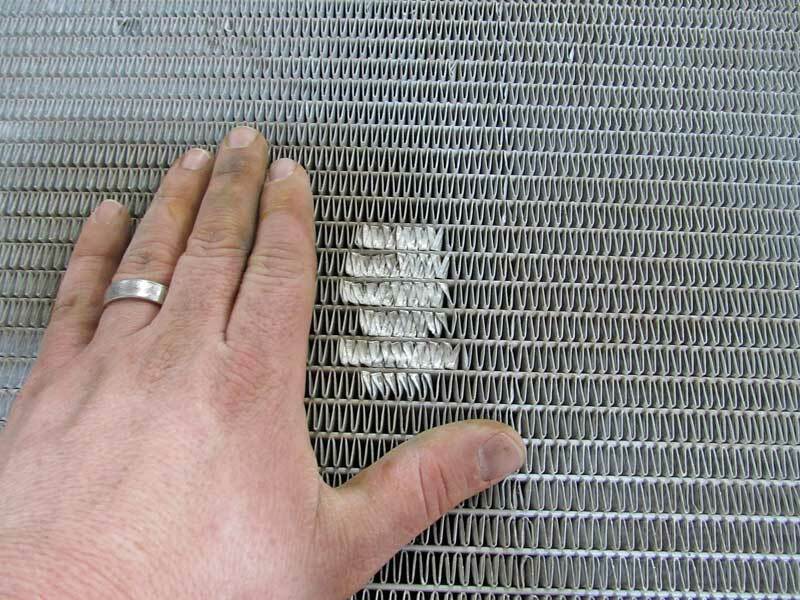 Small rocks can do a number on your aluminum radiator if it hits just right. Bent fins are not a big deal, as long as they are smaller than a tennis ball. An area larger than that can cause some issues. If you find any bent or damaged fins, look at the tubes around them. The fins only dissipate the heat; it is the tubes that hold the coolant. Damaged tubes could have micro cracks that will eventually turn into full-blown leaks. Small fin damage is not a big deal, it happens. This is major fin damage. You need to repair the fine, as it is cutting off a fair amount of air flow. 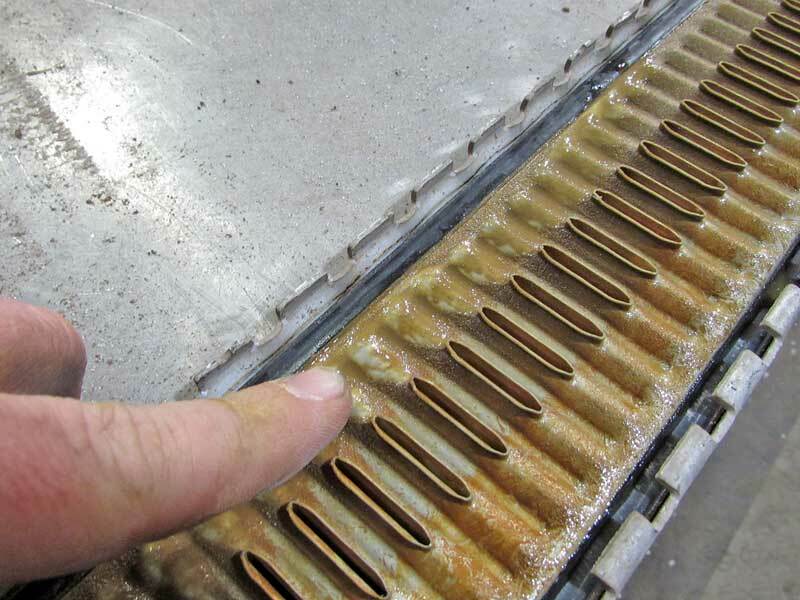 Copper and brass radiators can be cleaned up with a fin comb, but these don’t work well on aluminum fins. A pick works to lift the bent fins. 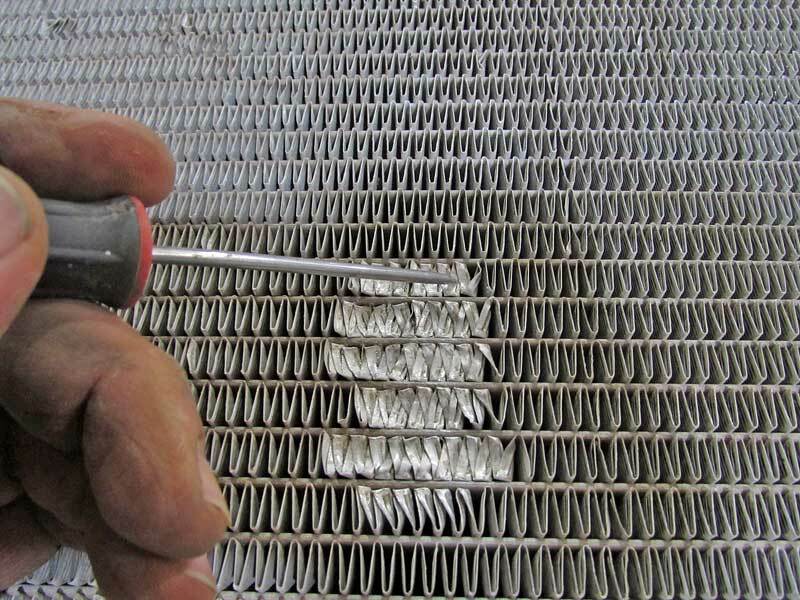 Aluminum radiators often have perforated fins, so you can actually peel the edges off, revealing unbent fins. Just pull off the fin, and it breaks away. This is the end result. It isn’t pretty, but air can flow through it. Nothing ruins a road trip or even the drive home like car trouble. 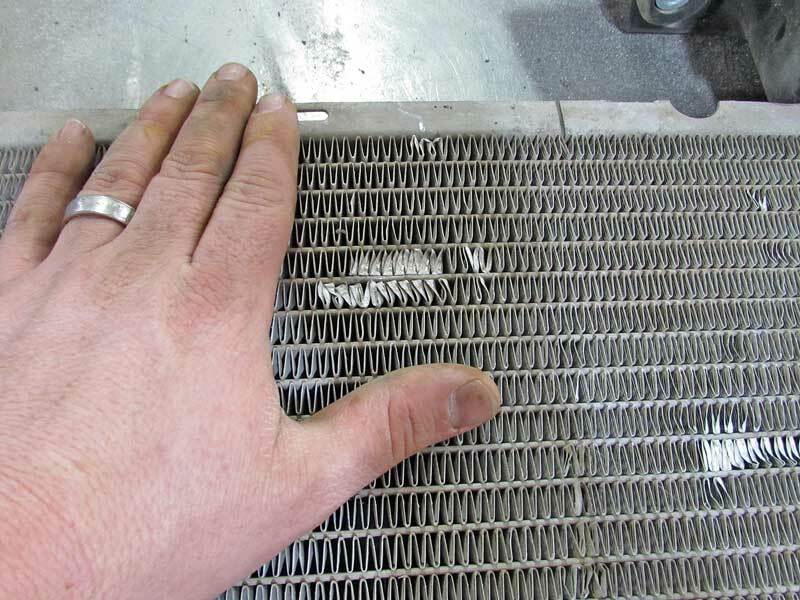 Inspect your radiator annually to look for potential problems and save yourself a tow bill or worse. When in doubt, seek out the expertise from your local NAPA AutoCare Center. Happy travels. Check out all the heating & cooling products available on NAPA Online or trust one of our 17,000 NAPA AutoCare locations for routine maintenance and repairs. 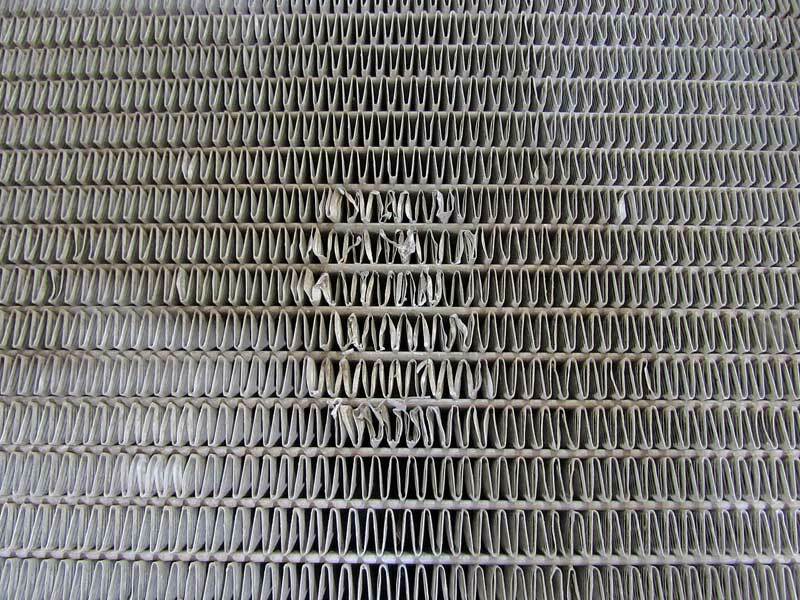 For more information on radiator failures, chat with a knowledgeable expert at your local NAPA AUTO PARTS store.